PACK MULE are built for the long haul, with the power to get the job done. PACK MULE's NXG Burden Carriers can handle the heaviest loads for industrial facilities such as manufacturing plants, warehouses and distribution centers. 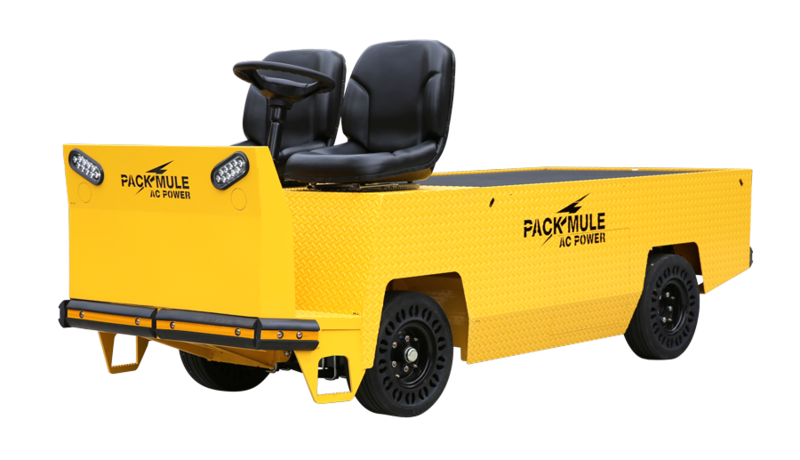 Regularly used for order picking, towing and as maintenance vehicles, Pack Mule offers sit down and stand up models with towing capacities ranging from 2,000 to 8,000 lbs. If you're looking for a superior solution to increase productivity in any warehouse or facility you've come to the right place. Specifications PDF 35.5" 18" Front 30" Rear 74.5" EXTRA LENGTH INCREASES DECK SPACE BY 25%. The BC-520 is 7″ wider and offers 336 sq. inches more deck space than the BC-500, but with the same tight turning radius, substantial deck weight capacity (1,000 lbs.) and towing capacity (2,000 lbs.). Specifications PDF 35.5" 18" Front 48" Rear 92" EXTRA LENGTH CREATES LARGEST DECK SPACE FOR OPERATOR SEATED TUGGER! The BC-620′s extra length provides great deck space (2,343 sq. in.) but also requires a little extra turning radius. Specifications PDF 35.5" 18" Front 53" Rear 80" LARGEST DECK SPACE & CAPACITY WITH 2,000 LB. TOWING. The BC-625 combines the largest deck space (a whopping 2,520.5 sq. in.) and towing capacity (2,000 lbs.). Specifications PDF 31.5" 48" 55" MAXIMUM CARGO DECK & MINIMUM TURNING RADIUS! The SC-775 combines the largest cargo deck (1,890 sq. in. with the free 60″ deck length upgrade) with the minimum turning radius (55″) of any stand-up tow vehicle. Specifications PDF 35.5" 18" Front 30" Rear 74.5" ADDED DECK SPACE & CAPACITY WITH 5,000 LB. TOWING. The BCT-5200 delivers great deck space (1,704 sq. in.) and capacity (1,200 lbs.) as well as 5,000 lbs. of towing capacity. Specifications PDF 35.5" 18" Front 48" Rear 91" EXTRA DECK SPACE! The BCT-6200 (with either bucket or bench seat) provides great deck space (2,343, sq. in.) and capacity (1,200 lbs.) as well as 5,000 lbs. of towing capacity. Specifications PDF 35.5" 18" Front 53" Rear 80" LARGEST DECK SPACE & CAPACITY WITH 5,000 LB. TOWING. The BCT-6250 combines the largest deck space (a whopping 2,520.5 sq. in.) and capacity (1,200 lbs.) as well as 5,000 & 6,000 lbs. of towing capacity. 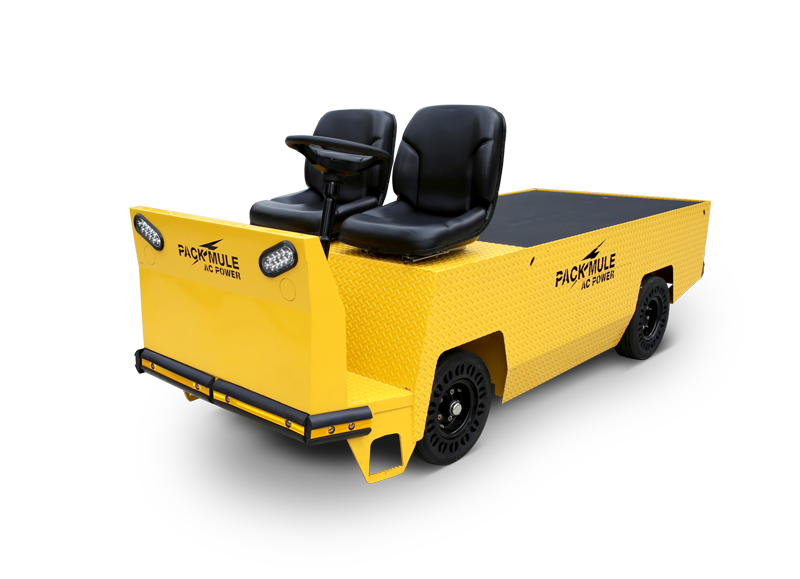 Specifications PDF 35.5" 21.3" Front 25" Rear 80" HEAVY DUTY TOWING – INDUSTRIAL BATTERY FOR RAPID AND OPPORTUNITY CHARGING! The BCG-6200 was designed specifically for a major auto producer to accommodate an industrial battery capability, allowing it to be charged during brakes and keep running through all three shifts. Specifications PDF 44" 76" 156" LARGEST CARGO DECK! The BCT-9000 provides our largest deck space and capacity as well as 5,000 lbs. of towing capacity.